(April 17, 2013) The Islamic Society of North America (ISNA) congratulates Muhammad Yunus for being awarded the Congressional Gold Medal. Prof. Yunus is the first Muslim to be awarded what is the highest civilian honor bestowed by the U.S. Congress. 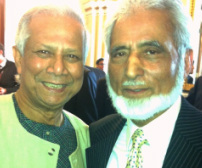 Leaders of the U.S. House and Senate presented Professor Yunus with the medal at the U.S. Capitol for his hard work to implement the creative idea of microcredit throughout Bangladesh and globally. His work helped millions of impoverished people, especially women, take charge of their lives to overcome devastating poverty. A video of U.S. Speaker John Boehner presenting the medal can be viewed here.